Among the vibrant areas of interest for scholars of religion is the emergence of new religions. Unlike the religions of antiquity, New Religious Movements provide a direct view, occasionally in “real time,” of what constitutes religious belief. The possibility of sitting Jesus, or even Paul, down for an interview remains vastly remote. The same is true of Ellen White or Joseph Smith, but here we have many historical records upon which to draw and a clearer context against which such religions might be read. Supposing the religious urge is something people of antiquity felt, we can get a sense of what might have satisfied that itch, at least in an oblique way, by looking at the modern period. As a student of religion I was mired in the ancient period. Learning obscure, dead languages, I supposed, would lead me back to the earliest forms of religious belief, therefore the most authentic. Like many of my colleagues, I came to discover that the origins quickly disappear into the distorted view our poorly ground telescope into the past reveals. As one writer recently suggested, if humanity evolved in Africa, so did religion. 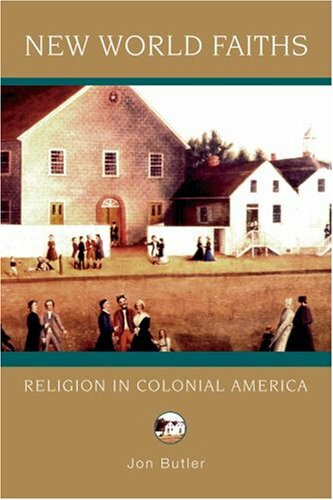 This past week I read Jon Butler’s New World Faiths: Religion in Colonial America. Growing up I always felt that our own history was too young to be interesting. As I learned more about the horrid treatment of Native Americans, my sense of newness was accompanied by a sense of collective guilt. I like to think I wouldn’t displace a population in hopes of getting wealth, but as Butler demonstrates, the colonial experiment from the beginning was a profoundly religious one. We all know the pilgrims were dissenters from the established Church of England. Butler takes time to pause and consider the unwritten religions of those subjugated to European rule and sometimes extermination. How many of the first to brave the Atlantic crossing did so with missionary zeal, convinced of the superiority of a Christian culture. Not incidentally, they noticed great wealth could be had in this new land. Slaves would be needed to extract it and the Bible seems a slave-friendly document. Butler’s little book is a good guide to the larger issues. The religion of African slaves grew into something to be feared. Colonial religion split along hairline fractures of doctrine, leading to the fascinating multiplicity of religions we now have in this country. Then, in his discussion of the early Presbyterians of Philadelphia, I ran across a sentence with immense explanatory value: “At the same time, congregations found that they could exercise their own power over clergyman through controlling their ministers’ salaries.” Conviction quickly falls by the wayside with a God whose arm is too short to save. The paycheck is something you can take to the bank. Religions develop into something different once gold enters the equation. I have watched the birth of empires with megachurches and televangelists in my own lifetime. I know that we are witnessing the birth of yet another human scheme to acquire eternity in the form of liquid assets. This entry was posted in Books, Posts, Religious Origins, Sects and tagged Church of England, Jon Butler, megachurch, New Religious Movements, New World Faiths, Presbyterian, slavery, televangelists by Steve Wiggins. Bookmark the permalink.